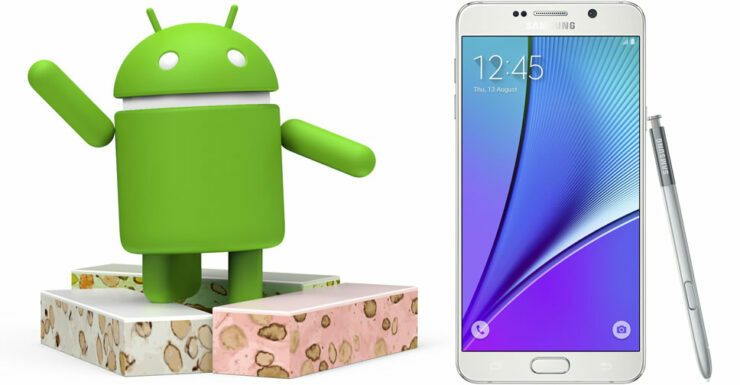 Samsung Galaxy Note 5 users can finally taste the flavors of Nougat – officially. UVU4EQC6 Android 7.0 Nougat firmware is now available for the device. With T-Mobile finally releasing the update, here are all the steps and links that you need to update Galaxy Note 5 to Android 7.0 Nougat official firmware. You should be able to update your Note 5 if you have received the over the air notification. However, if you can’t wait to get your hands on Nougat, this guide will help you manually flash the official firmware. Please check these prerequisites before going forward to the update steps. Download and install USB drivers for Galaxy Note 5 on your computer. Ensure that your Samsung Galaxy Note 5 carries more than 70% of charge. Note that this guide is tailored to T-Mobile Samsung Galaxy Note 5 but the steps can be followed for any other Note, as long as you are using the right firmware file for your own device model. Required files: download N920TUVU4EQC6 Android Nougat for T-Mobile Note 5 from here (Sprint from here). Extract the zip file. Also, download Odin 3.12.3 from this link . Switch your Samsung Galaxy Note 5 off and boot it in Download mode: press and hold Volume Down, Power and Home buttons together. Connect your smartphone with your computer and wait for Odin to detect your device. CSC and select file with CSC in its name – ignore if you didn’t get any such file. Click on PIT and select the. pit file – ignore if you didn’t get any such file. BL and select file with BL in its name – ignore if there is no such file. When Android 7.0 Nougat update installation is successfully completed, you will get a PASS message on Odin and your Note 5 will reboot. Once you see the home screen, you can disconnect your Samsung Galaxy Note 5.